This has got to be one fo the coolest things I've seen in a long long time. Directing collective Legs created a Victorian circus Zoetrope for Temperley London to showcase their Spring 2010 line (also circus themed, hence the inspiration) at fashion week. I love the creepy beauty that the old time circus aesthetic has. Check out the Zoetrope in motion below and for more info about the making of process see here. 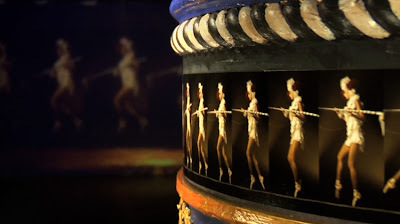 Temperley London Circus Zoetrope from LEGS on Vimeo. ..and speaking of Zoetrope's and advertising, just last year Sony Bravia landed a spot in the Guiness Book of World Records for creating the largest Zoetrope. Very cool. Check it out.